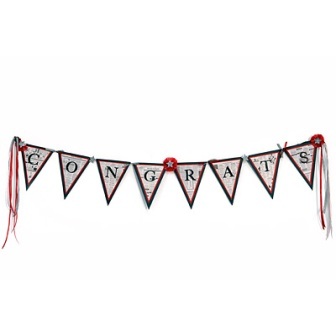 Say "congrats" to the new graduate, a friend with the great new job, or other achiever. The giant letters will make the message loud and clear. Find this craft from Sizzix and 17 other graduation crafts in our FREE Graduation Craft eBook. Die-cut Letters out of plain paper and adhere to hand-cut paper triangles. Attach triangles to a length of ribbon to create a banner. Die-cut Stars out of plain paper and embellish with glitter. Adhere to the banner. Embellish with ribbon, pipe cleaners and tissue paper.